Facebook's purchase of WhatsApp for $16 billion (about £9.5b/AU$17.7b) isn't supposed to change the popular instant messaging app, but it certainly changes the landscape of the real-time messaging services. That's because the world's No. 1 social network just bought its way into the hands WhatsApp's engaged usersbase, which according to Mark Zuckerberg is on a path to one billion people. But more than the sheer number WhatsApp chatters, Facebook appears to be interested in the fact that many of the active users of this SMS-alternative are from developing countries. "WhatsApp I think is the clear global leader," said Zuckerberg in a conference call following the WhatsApp acquisition announcement. "There are countries [like] Korea or Japan where another messaging service is bigger, but if you look across the world, WhatsApp - across Europe, Latin America, India, a lot of places in Asia - is the clear leader." International growth, especially in the developing world, is something that Facebook has been stressing in its financial conference calls every quarter for the past year and a half. That's likely because while the social network reaches 1.23 billion monthly active users, it's approached saturation in the developed world. Who do you know who doesn't have Facebook? Facebook's Internet.org campaign in partnership with Samsung, Nokia, Qualcomm and other tech companies is intended to bring affordable internet access for that very reason. It occupies more than one billion "chairs," but what about the internet-deprived who can't afford or don't have access to one? They deserve a seat that the table, and besides Internet.org, the SMS-snubbing WhatsApp is one way to bring them into the Facebook (and internet-at-large) fold. "About 11 days ago," recounted Zuckerberg, "I proposed that if [Facebook and WhatsApp] joined, that would help connect the rest of the world and could help out with things like Internet.org by bringing these two very different communication tools together." At the same time WhatsApp is on an unchanged course toward one billion users, Facebook is transforming its mobile presence with standalone apps and company takeovers. Within Apple's iOS App Store and the Google Play Store, you'll find Facebook has developed its own Messenger, Flipboard-style Paper, Snapchat-clone Poke and Instagram-esque Camera apps. Prior to today, no app has been more important than Instagram, which Facebook bought last year for $1 billion (about £599m, AU$1.1b) in cash and stock, and has kept its promise of keeping intact. It hasn't merged the popular photo- and video-sharing service with its long-forgotten Camera app. 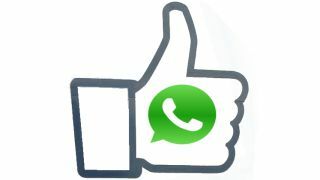 "WhatsApp is going to operate independently," reiterated Zuckerberg during today's call. "We want to do this the same we did Instagram. This is obvious a bigger scale - a much bigger scale. "I think [Instagram Co-Founder] Kevin [Systrom] would say that he's gotten a huge amount of value out of being able to use Facebook infrastructure. That's been very valuable to him in scaling. That's going to be the model here too." Zuckerberg stated that Facebook's "explicit" WhatsApp strategy is to focus on growing and connecting everyone in the world. But it also stands to be very profitable. "Services in the world that have a billion people using them are all incredibly valuable," he said. This sort of mobile growth has been the steadfast goal of the social network for the last two years, and it has recently begun to see more profit from its mobile app initiatives than computers. That doesn't mean you should expect WhatsApps ads anytime soon. The creators of this subscription-based messenger have long been against delivering ads, and Zuckerberg says he shares this stance, for messaging platforms at least. "Once we get to being a service that has a billion, two billion, three billion people one day, there are many clear ways we can monetize," he said without giving further details. The vision of three billion people using WhatsApp seems like a far way off when it only has 450 million monthly active users, but it achieved that figure within just four years, more than 2.8 times faster than Facebook did. Facebook execs didn't have statistics about the potential overlap between WhatApps and Messenger users, but Zuckerberg thinks that the two can co-exist. "They actually serve fairly different use cases. Messenger evolved from Facebook Chat, which was more of instant messaging, not SMS, and is widely used today are chatting with Facebook friends. And a lot of the messages aren't real-time, almost like a more informal email. "WhatsApps evolved from evolved from really replacing SMS. It's a service for very quick and reliable real-time communication with all of your contacts and small groups of people. "The world needs both," he concluded, with an understood emphasis on "the world." Read about the future of wearables for every part of the body.